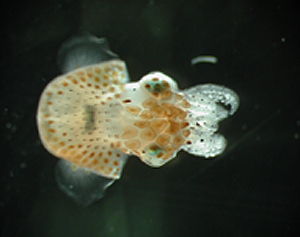 The ink sac (black bilobed structure), which is associated with the light organ, can be seen through the mantle cavity in this juvenile squid. Image credit: Tanya Koropatnick. V. fischeri is a luminous, Gram-negative, marine heterotroph belonging to the family Vibrionaceae, which contains species that engage in both cooperative and pathogenic interactions with host animals. V. fischeri is found throughout the world in temperate and subtropical regions, existing as either a free-living saprophyte, a member of the microbial gut community in many marine mammals, or a light organ symbiont in several species of squid and fish (Nealson and Hastings, 1991). The Hawaiian bobtail squid, Euprymna scolopes, is a small, nocturnal, marine invertebrate that spends its nights hunting for prey in shallow waters. 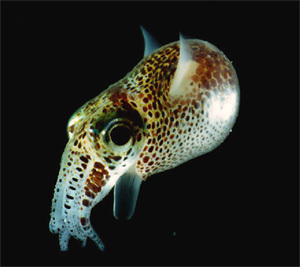 Like many other cephalopods, a startled E. scolopes can release a squid-sized blob of ink to serve as a decoy, distracting would-be predators and allowing the animal precious moments to escape. This stealthy squid can hide by burying itself in the sand, and it can also change color by contracting or expanding special pigment-containing chromatophores in its skin. Another sophisticated tool in the bobtail squid's anti-predatory arsenal is a colony of luminous V. fischeri, which are housed in a specialized light organ within the squid's mantle cavity. The mature squid light organ consists of several host tissues, including a central core of epithelium-lined crypt spaces that contain the bacterial symbionts, a reflector and ink-sac that function to direct the bacterial luminescence, and a thick lens and yellow filters, which presumably modify the quality of the emitted light (Montgomery and McFall-Ngai, 1998). The light produced by the symbiont is emitted downward, and the squid can manipulate the intensity of the light to match the intensity of down-welling moon and starlight, thus masking its silhouette to evade bottom-dwelling predators (Jones and Nishiguchi, 2004). 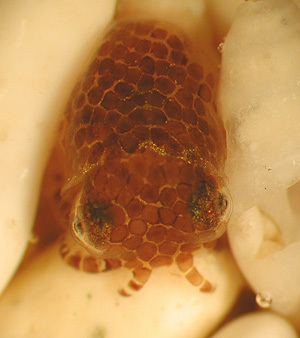 This small hatchling squid is sitting on sand grains. Image credit:Tanya Koropatnick. In the squid-vibrio symbiosis, both the squid and its bacterial partner have developed cooperative mechanisms to ensure efficient light-organ colonization by the appropriate bacterial cells. The juvenile squid hatches into seawater teeming with microorganism (1 million cells per ml of seawater! ), and although V. fischeri cells make up less than 0.1% of the natural bacterial community, the light organ becomes colonized within hours after the squid hatches (Nyholm and McFall-Ngai, 2004); however, if V. fischeri cells are not present in the seawater, no other bacteria will colonize the light organ. Interestingly, mutant V. fischeri strains that are defective in light production can colonize the light organ but are unable to persist at wild type levels, and these mutants are out-competed when the squid is also exposed to wild type V. fischeri cells (Visick et al., 2000). Additionally, even though closely related Euprymna spp. can become infected by V. fischeri strains isolated from other closely related squid species, the non-native strains are out-competed when the animals are also exposed to their native strain (Nishiguchi et al., 1998). Thus, the squid can select from different V. fischeri strains to find the most suitable symbionts. The newly hatched squid light organ has specialized structures for harvesting symbiotic V. fischeri from the seawater that enters the mantle cavity during gill ventilation. The surface of the juvenile organ is covered in 2 elaborate fields of ciliated epithelia, which secrete mucus in response to a common bacterial cell-wall component, peptidoglycan (Nyholm and McFall-Ngai, 2004). The cilia on the surface of the light organ create currents to entrain bacterial cells from the seawater, but only Gram-negative bacteria become captured and form aggregates in the surface mucus. After several hours, symbiotic V. fischeri cells in the aggregate migrate through pores on the surface of the light organ, down ducts lined with outward-beating cilia, and into the crypt spaces. Within both the ducts and the crypt spaces V. fischeri cells must endure a harsh oxidative environment (Weis et al., 1996; Small and McFall-Ngai, 1999; Davidson et al., 2004), and this ability to tolerate oxidative stress may be a key to the strict specificity of the symbiosis. 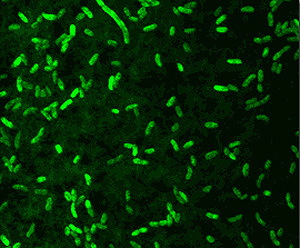 This micrograph shows fluorescently stained Vibrio fischeri cells. Image taken by E Nelson and L Sycuro, provided courtesy of the Vibrio fischeri Genome Project. Once colonization has taken place, the symbiotic V. fischeri cells in the crypts trigger a series of developmental events that transform the light organ from an instrument of symbiont acquisition to the functional adult light organ. Symbiosis-specific changes in light-organ morphology are signaled by the V. fischeri-derived envelope components lipopolysaccharide and peptidoglycan, which work synergistically to induce widespread programmed cell death (apoptosis) in the ciliated epithelial fields on the surface, and subsequently, the complete regression of this 'symbiont-harvesting apparatus' over a period of 4 to 5 days (Foster et al., 2000; Koropatnick et al., 2004). Once established, the light organ symbiosis is maintained for the squid host's entire life. In fact, not a single aposymbiotic (squid without light organ symbionts) squid has ever been discovered amongst the hundreds of wild E. scolopes captured for laboratory studies (Boettcher and Ruby, 1990). The squid nurtures its symbionts by supplying the light-organ colony with a source of carbon and nitrogen in the form of peptides and proteins (Graf and Ruby, 1998). Over-population of the crypt spaces is controlled by a daily venting event, involving the expulsion of 95% of the crypt contents out through the pores each dawn (Lee and Ruby, 1994). The remaining crypt symbionts will then multiply to repopulate the crypts over the following day. Complete list of cited references. Learn more about squid-Vibrio symbiosis with this collection of news articles, informational websites, classroom activities, and more! Explore careers in this fascinating field by visiting a few lab pages of the scientists. For additional resources about Squid-Vibrio Symbiosis, search the Microbial Life collection.